"Neopia is in trouble. An ancient evil is rising. And it's up to you to stop it!" In NeoQuest you play a white Lupe transported back in time to Ancient Neopia. The game plays very much like the old computer roleplays where you wander around talking to NPCs (Non-Player Characters), fighting monsters and collecting objects. This guide will introduce you to the ins and outs of how to play. To begin a new game simply go here and click where it says "Click here" to start a new game. I'm assuming, seeing as you're reading a beginner's guide, that you've never played NeoQuest before and the only option will be to play in Normal mode. There are three levels of difficulty, but more on that later. Note: NeoQuest games are "attached" to your active pet - this is supposedly so each of your pets can have games running at the same time. When you click in to play NeoQuest you are starting a game for whichever pet you currently have active. 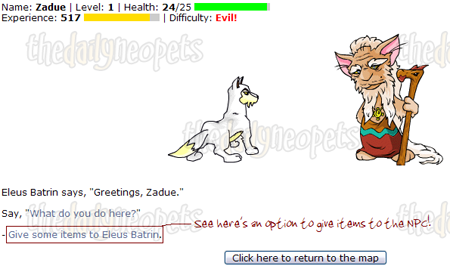 If you change active pets and click back in to NeoQuest you will then be prompted to start a new game for whichever pet you now have active. This is particularly important because NeoQuest games usually take more than a few days, especially the first time you play. To get back your original game's progress simply activate the pet you began the first game with. Fire Weapons With skill points in this you have an increased chance of doing more damage to your opponent. Firepower This increases damage done with the other fire-based skills. Fire Ball You can cast fireballs at your opponents. As this is "castable" you'll get to chose when you use it! Wall of Flame When you get hit, your opponent takes some damage too. 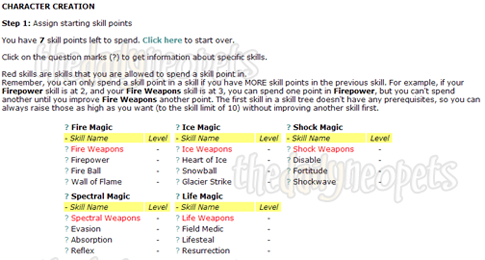 Ice Weapons With skill points in this you have an increased chance of doing more damage to your opponent. Heart of Ice You have a small chance of freezing your opponent for a turn. They can still use special skills however, like their own versions of these skills. Snowball This lets you throw snowballs at your opponent. Again, it's castable so you chose when you use it. Glacier Strike An impressive attack, it does a lot of damage. However it takes three turns to charge during which you can't attack. Shock Weapons You have a chance of stunning your opponent so they can't do anything for one turn. Disable Attacks have a chance of lowering your opponent's ability to defend against you. Fortitude With this you have a chance of resisting your opponent's attacks and their attempts to stun you. Shockwave Each attack has a chance of sending a "Shockwave" at your opponent, causing them to take some damage and stunning them for one turn. Spectral Weapons You can defend yourself better from your opponent's attacks. Evasion With this there's a chance you can avoid physical attacks completely (i.e. take no damage). Absorption This is another castable skill, and lets you absorb an attack from your opponent and turn the damage into health for you. Reflex I like this skill: it causes some of your opponent's attacks to be reflected back to them, meaning they hit themselves instead of you! Life Weapons Lets you heal while walking around. The higher the skill, the faster you heal. Field Medic Gives you a chance to "regenerate" health during a battle. Lifesteal When you hit your opponent some of the damage you do to them is turned into health for you. Resurrection I can't say I've ever actually used this ; its better to simply not die - but this one does give you a chance to be brought back to life if you do die during a battle. Once you start gaining skill points from levelling up (see below) you can then either add to those, so you have a higher skill level in them, or start buying skill in the other magics. Again, this is up to you, and how you find you like to fight. I prefer to concentrate on defence and healing, which is why I like the last three areas of magic, but if you like a good offensive then by all means try your luck with Ice and Fire magic. Now you're happy with your choices, click to confirm what you have chosen and you'll move on to picking your first weapon! Actually, at this early point in the game it doesn't matter which weapon you pick, they're all equal. Later, when you begin to upgrade the different ones have different effects but for now you can pick whichever you like. I usually stick with the Life weapons, because those are what I use later in the game, and that's where I've used my skill points. If you've used your skill points in a different way to how I have above however, it's a good idea just to pick the weapon which corresponds to whichever magic you've favoured. The game will now ask you to confirm all the choices you've made so far. If you're happy with everything click to confirm and you'll move on to begin the actual game. The first line should be pretty straight forward. The Name is the name of the pet that is "playing". 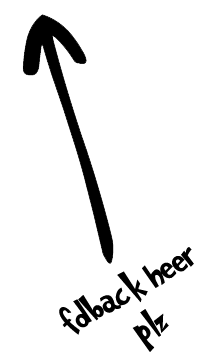 Level refers to which level you are on. You start at 1 and get upgraded based on the amount of experience you gain. Health should (hopefully) be fairly self explanatory - it's how healthy you are! If it ever reaches 0 then you will lose 400 experience points (more later, promise) and be sent back to where you are now. The green bar is a visual representation of your health, it goes down as your health does, and changes colour to yellow and then red as you get close to dying. As for the next bits, here goes! This is how "experienced" you are at fighting. As you defeat enemies in the game your experience will go up. How many experience points you gain from each defeat usually depends on both your opponent's level and how many health points they had to begin with. It does vary from opponent to opponent though, even when they appear to have identical stats. The bar next to your experience points records how far you have to go before your level goes up. As you progress through the game you will meet monsters with higher and higher levels. Sometimes you will find that simply moving through the areas isn't enough to sufficiently raise your level in order to beat the next lot of monsters you find. In those instances you will have to go back a bit until you find monsters you can safely beat, gain more experience and level up before you return to progressing through the game. This can be annoying at times (especially when you have to stay back to level up over 6 levels at a time later in the game) and very time-consuming but it is worth it. Much better than running full steam ahead into a nest of monsters that kill you and send you back to Neopia City! You also gain Neopoints each time you go up a level, the higher the level, the more Neopoints you get. The maximum level you can reach is 50, and that's the level of your final "boss" (see below). This is the way you move through the map. There are three different modes, though I don't think I've ever actually used the Normal one at all! Basically you use Hunting most of the time, because that way you meet lots of enemies and level up quicker (without having to go back too much). There are some times however when you need to move through areas and you don't want to fight. This could be because the enemies are too weak to give you any experience at all. It's pretty pointless to fight them then, unless you just like beating up on those a lot weaker than you (shame on you! ), so if you turn on Sneaking you will move past most of them and avoid pointless fights. The other time you might like to Sneak is if you are low on health and are using your Life weapons skill to heal. So now you're finally ready to play the game! You can use the directions arrows (*pokes picture*) to move around the map, left right, up down, and diagonally. The bit of text under it will tell you where exactly in Ancient Neopia you are. Well, as exact as it gets in an age where GPS is a distant dream and you can only see about three squares in any direction! 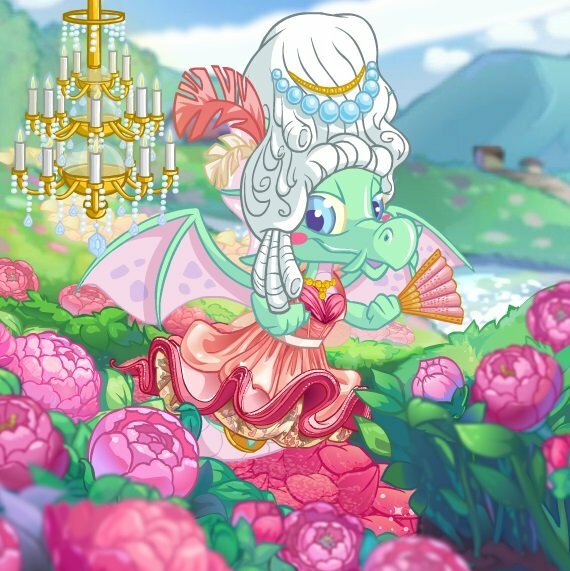 As I'm sure you've already seen, you start in Neopia City. You can talk to quite a few people here (called Non-Player Characters or NPCs), and they will tell you that if you can bring them some various items they will make weapons and armour for you. Lummock Sendant will make you the other four wands you didn't pick to start with. You may get him what he wants if you wish, but you don't need to. The wand you chose at the beginning is quite sufficient, you don't need the others. Morax Dorangis is the first of the people you'll want to talk to, as he will make your first set of amour! The items he asks for will be dropped by the enemies just around Neopia City. For now you can talk to Choras Tillie and Eleus Batrin to see what they want, but you won't be able to complete their tasks until you have moved further on in the game. Perhaps the most important NPC here is Boraxis the Healer. If you talk to him whenever you are running low on health he will heal you back to full again. You will meet various other NPCs throughout the game. Some will simply give you information and hints about what you have to do and others will require you to do something for them. As quite a few of the NPCs you meet will require you to give them items, I should probably tell you how, just in case you can't figure it out on your own. Its not that hard really - once you're on the same square as the character you want to give items to click to talk to them to the right of the map. You will then be able to ask them questions, or give them items. You will then be taken to a list of the items you currently have, where you can select which items you want to give to the character. Click to begin the fight and you will be taken to the main fight screen. 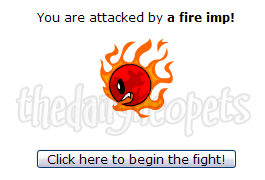 Its something you'll be seeing a lot of, as fighting is the main part of NeoQuest. Pretty much all you'll be able to do at this point is Attack, Do Nothing or Flee, unless you spent skill points in some of the castable magics (then you will see the option to do those under attack) or have found some healing potions (see below). To begin with just attack or use magics if you have them. At this point you shouldn't die, though if you are about to you can try to flee so you can heal. If you're low on health don't forget you can visit Boraxis and he'll heal you. 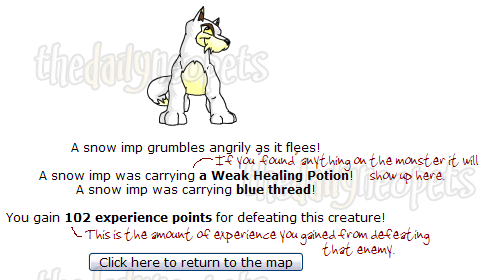 Once you defeat the imp, click to see what you've found and how many experience points you gained. 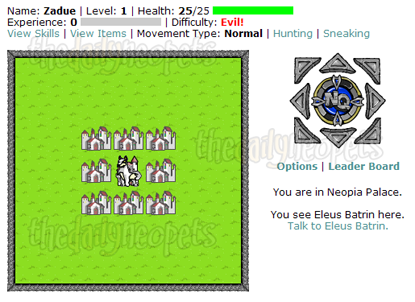 At the end of each area in NeoQuest you will find a sort of "boss" monster. The first one of these you come to is Xantan the Foul, at the end of the Dank Caves. These aren't like ordinary monsters as you only face them only once, and they are always in the same spot (as you approach you'll be able to see them on your map). Usually you need to defeat them to gain something you've been asked to find. In the case of Xantan you will get Xantan's Ring, the object that you need to make your second set of weapons and armour in Neopia City. You also gain a fixed amount of experience points and Neopoints for defeating each boss. 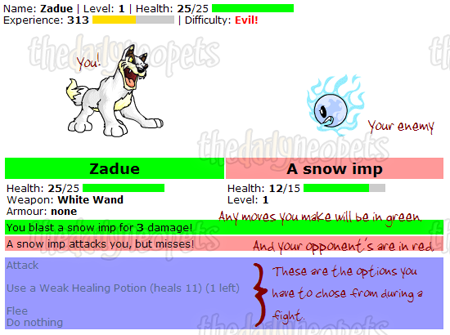 As you fight you will notice that it is an option to use your healing potions during a fight as well. Try not to need to use them then during a battle. They waste a turn you could have used to attack with, and give your enemy an advantage. If you can, heal between battles. The exception to this is of course the boss fights. I usually find I have to use at least one potion during a boss fight, even if I'm at full health when the fight starts. Stay around Neopia City until you've levelled up a bit. This way you'll get used to the fighting style of NeoQuest, and collect the healing potions and the other items you'll need later in the game. Once you get to level 3 you can move a bit further out and find harder enemies. You'll soon have all you need for your first set of armour! If you want to train without moving around all the time refresh here . You can then stay in the same place, but still be attacked by monsters. Find a site that offers NeoQuest maps. These are incredibly helpful, especially in the levels with mazes! Yes, I said mazes. NeoQuest is big on mazes, there are quite a few. The maps are useful so you don't wander around in circles - which you'll do enough of levelling up anyway, trust me! Try to always be a level or two above the monsters you find in each area. This will make the fighting easier for you, and reduces the chances of you dying. Later in the game this won't be so important, though I'd still try to stay at least at the same level as the monsters you are facing. Use at least some of your skill points in Life magic. The ability to heal will become incredibly important as you get further into the game, when you are far from Neopia City and running low on healing potions. To start with, as I've already said, you win Neopoints each time you gain a new level and when you defeat the boss monsters. If you level up all the way to level 50 (which you should) and defeat all the bosses along the way then the Neopoint rewards total about 43,875 NP. When you complete the game you also gain a trophy for your user lookup. I mentioned earlier that there were three levels of difficulty right? Well, this is where that comes in. You get bronze for completing it on Normal difficulty, silver for Evil and gold for Insane. You must complete Normal to gain access to Evil, and Evil to gain access to InSaNe!. This avatar is awarded about halfway through the game, after you defeat the Archmagus of Roo (the boss monster in the Temple of Roo) and give the Clouded Gem you get from him to Erick the Cybunny. If you need maps to complete your NeoQuest journey, make sure to check Tae's NQ Maps! Well, hopefully you've learnt a bit about how to starting in your own game of NeoQuest, and the other basic skills to start you on your way. So what are you waiting for? Go and save ancient Neopia! Also, if you enjoy this game, you might be interested by NeoQuest II.